Ruth A. 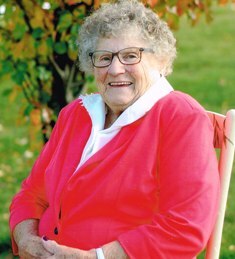 (Miller) Jones, 94, of Sparta, passed away, Saturday, April 6, 2019, at Morrow Memorial Home in Sparta. She was born December 1, 1924, in Melrose, to Hosea and Mary (Bramer) Miller. On September 1, 1945, Ruth married Roger S. Jones at the parsonage in Melrose. She was very much involved working alongside Roger on their farm. Ruth was an active member on the election board in the Township of New Lyme and also at the Cataract United Methodist Church. She will be dearly missed by her family and friends. Survivors include her children, Rodney (Margaret) Jones, Rita (Max) Barenthin, Roberta (Gene) Filler, Pamela (Paul) Von Wald, Pauline (Steve) Becker, Bonnie (Orlen) Anderson, and Jodi Kim Filler Jones (Russ Davis); 15 grandchildren; 26 great-grandchildren; one sister-in-law, Doris Miller; and many nieces, nephews, other relatives, and friends. Ruth was preceded in death by her parents; her husband, Roger; her siblings and their spouses; a grandson, Chad; and a great-granddaughter, Katie.